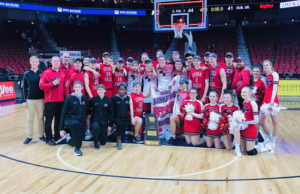 While many students participate in school sports throughout the seasons of their high school careers, only some athletes choose to continue to pursue their sport as they transition into college and university and swim under other colors than Cedar Falls’ red and black. 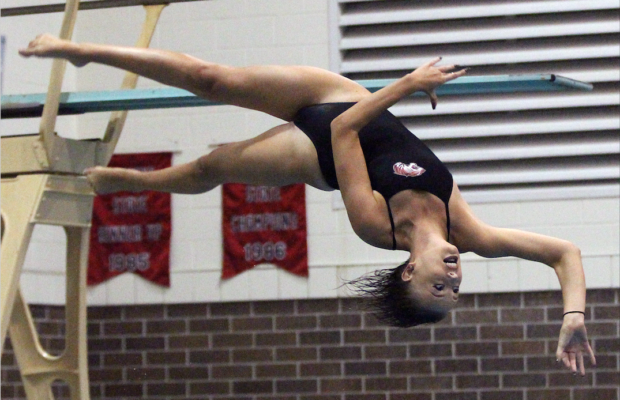 For athletes like senior swimmers Sammi Hall, Olivia Clark and diver Madison Schoppe, CFHS teams have become a vital stepping stone into the next level of their swimming and diving careers. Both Clark and Hall have been swimming for a club for over 10 years. Hall seconded Clark’s note of the rigor of high school swimming. “Cedar Falls prepared me for college in many ways like determination with long practice hours, commitment to the demanding practice needs, getting along with many girls at a time and balancing all the crazy emotions throughout the stressful season,” Hall said. She will be swimming for Coe College this fall. Many swimmers on the women’s swimming team lack the extensive experience with club swimming like Hall and Clark do, so they work hard and train for long hours to learn the sport to be competitive at a high level. Senior diver Madison Schoppe is one of these teammates who started diving at a much later age, when she was in eighth grade. “Off season is a challenge since we can’t practice with our high school coach off season. I just try to keep in good shape during off season, and during season it’s diving every single day and much more time commitment,” Schoppe said. The commitment of diving for Cedar Falls proved to be worth it, however, and Schoppe placed fifth at the state meet in October and plans to dive for Cedar Falls’ own University of Northern Iowa Panthers next fall. “Coach Vic [Laughlin] has always pushed me to be a better diver at every practice, and I think this has prepared me for diving in college because I will understand that hard days are going to be unavoidable and they’re necessary for improvement.” Schoppe said. Even teammates who are not swimming in college, such as senior former club and CFHS swimmer Katherine Wikner, have lessons and skills from Cedar Falls’ program they will be able to take beyond the pool, and she credits head coach Mike Hagensick for pushing athletes to do things beyond what they thought they were capable of. As Clark, Hall and Schoppe leave behind their Tiger uniforms, their gratefulness for their experience on the team remains. As for other upcoming athletes and swimmers, Clark and Schoppe offered advice. “Competitive swimming can be demanding and frustrating at times, but it is really about forming close relationships during the practices and finding at least one aspect of the sport that keeps you coming back,” Clark said.